A few weeks into the 2015 Spring semester, BIC received the devastating news that beloved BICster, Desmond Maxwell, had passed away. As part of the inaugural BIC class, Desmond was a caring friend and mentor to classmates, faculty, and BIC administrators. His dynamic personality, good nature, and commitment to good causes was admired and appreciated by all. In his personal life, Desmond was a proud Harlemite and father. He was a graduate of City College who became a media and marketing professional after serving in the U.S. Marine Corps. He was extremely enthusiastic about receiving his Master's and being a member of BIC's inaugural class. 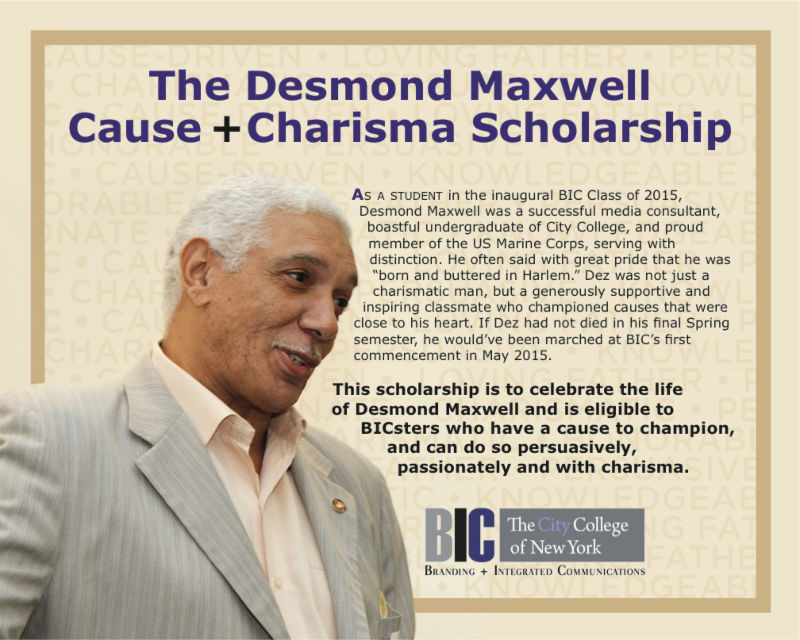 Shortly after the news of his passing, BIC Program Director Nancy Tag and the Class of 2015 embarked on a fund raising campaign to establish a scholarship in Desmond's honor. The Desmond Maxwell Cause + Charisma Scholarship was officially unveiled on May 27th during the BIC Graduation + Recruitment Party, with a fund raising achievement in excess of $50,000. This scholarship in honor of Dez will ensure that future BIC students will be able to benefit from the college that he so loved. A web page is under development where our AMAZING list of donors will be acknowledged and where contributions can be accepted.